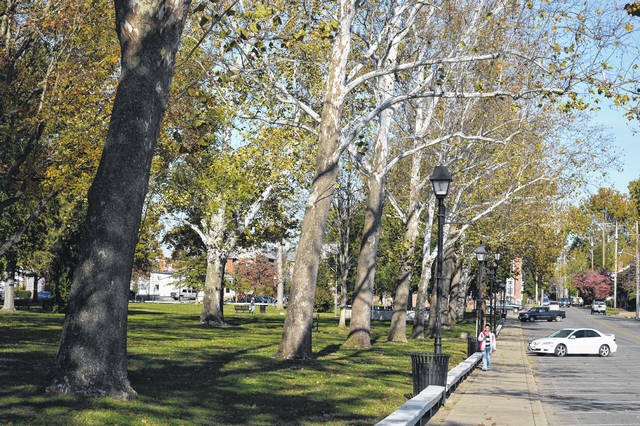 City Park will play host to Gallipolis in Bloom’s fall planting Saturday. GALLIPOLIS — Gallipolis in Bloom will be holding its Fall Planting Day at 10 a.m. this Saturday in City Park. Prospective volunteers can meet by the clock on Second Avenue. The event is open to all. Volunteers are asked to bring digging tools, gloves and not be afraid to get a bit dirty. According to GIB Volunteer Coordinator Kim Canaday, if around 50 individuals appear the group could plant its designated winter spaces in around an hour to an hour and a half. Canaday said that being near the river, Gallipolis could be slightly warmer than surrounding areas. Canaday said the group would also like to clear out the community and pollinator garden on Fourth Avenue but she was unsure if the organization would have time. Groups will sign up with GIB representatives before being handed plants and then assigned a specific location where they are asked to plant. “You either get a (big container) or two little ones,” said Canaday. Other than planting day, the group takes part in the December parade and Gallipolis in Lights tree decorating events and then takes a break until the beginning of the new year, when it starts to plan for the coming summer’s America in Bloom competition. Gallipolis in Bloom for the second year in a row was declared the winner of America in Bloom’s Circle of Champions for small communities earlier in October at the America in Bloom Symposium and Awards Celebration. GIB walked away with a four out of five bloom rating. The score is determined by the overall judging of a community’s collective efforts to meet AIB standards over six categories. Those categories include floral displays, environmental efforts, urban forestry, landscaped areas, heritage preservation and overall impression. Canaday said Gallipolis is traditionally strongest in its floral displays throughout town as well as its historical heritage preservation. She said GIB needed to step up its efforts in urban forestry, however. Canaday said she would like to see GIB increase its environmental efforts presence as well. Dean Wright can be reached at 749-446-2342, ext. 2103.
https://www.mydailytribune.com/wp-content/uploads/sites/42/2017/10/web1_DSC_0905.jpgCity Park will play host to Gallipolis in Bloom’s fall planting Saturday.